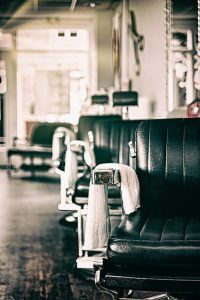 The Fourth Day of Health and Beauty! The third day of Health and Beauty! The second day of Health and Beauty! 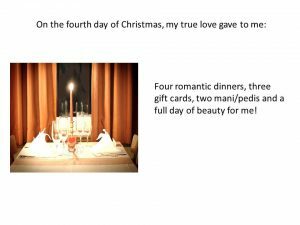 TWELVE DAYS OF HEALTH AND BEAUTY! 1. On the first day of Christmas my true love gave to me: A full day of beauty for me! 2. On the second day of Christmas my true love gave to me: 2 mani/pedis and a full day of beauty for me! 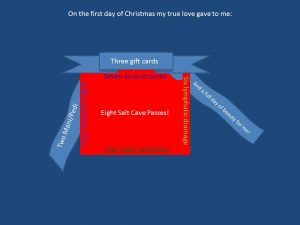 The Twelve Days of Health and Beauty! 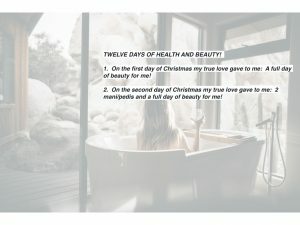 TWELVE DAYS OF HEALTH AND BEAUTY!! On the first day of Christmas my true love sent to me: a full day of beauty for me!